La Victoria Salsa Jalapena Red - Extra Hot - 12 oz. La Victoria Red Salsa Jalapena Extra Hot - 12 oz. A Jalapeno chile lovers salsa! Salsa Jalapena is an excellent garnish for those who like it HOT.Red jalapeno peppers, water, red california chiles, onions, tomato paste, distilled vinegar, salt, modified food starch and garlic. La Victoria Salsas. La Salsa Jalapena La Victoria es ideal para los amantes de la salsa con jalapenos. La salsa ranchera es excelente para acompanar cualquier platillo de la comida Mexicana autentica. Salsa roja muy picante con jalapenos rojos, chiles california rojos, pasta de tomate, cebolla, ajo, vinagre y sal. Great hot sauce! Family loves the extra hot and we can't get it here! Been buying this since 1968! 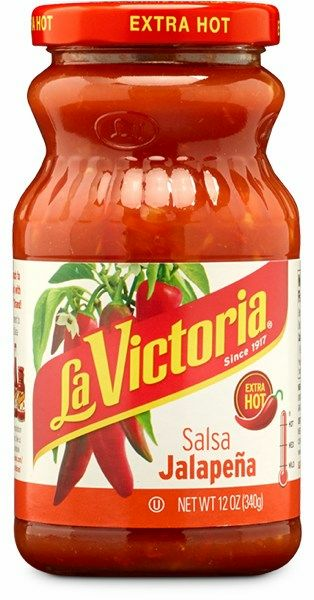 I've used this sauce from La Victoria for many years but in recent years it's disappeared from stores, even stores that carry most other La Victoria products. It's a hot salsa with less tomato and water than most other salsas. In fact it's mostly made of chopped red jalapenos. It's closer in taste to sri racha sauce without the sweet aftertaste and not as much garlic. It's definitely on the hotter side of La Victoria products and nothing else tastes quite like it. I use it on eggs and with Mexican food and grilled cheese sandwiches. For me it's worth going online to get it. ConsDoesn't seem to be available in stores any more. It is the hottest and best of the La Victoria salsas for seasoning but it is too hot to be in the grocery stores in my community. ProsIt is the MexGrocer that allows me to have this salsa. The depth of the MexGrocer product line that is special. But you have to like it hot! I can't find this in stores around here so order it online - that's how much I like it. Have been buying this sane salsa for 15 years. For some reason you can't buy it here anymore! Nothing compares to it! Red jalapenos! ConsWould like to know where in the Bay Area I can go to purchase this product? Have never found another salsa to top this one. My husband and I like this salsa but we cannot find it in the grocery store. That is why we order it. this is by far in my judgment the best Salsa there is. I have used this Salsa for the past 30 some odd year and it has never let me down. One of my favorites to cook with....good heat and excellent flavor. This is my favorite salsa dip for Tostito chips, restaurant style. I have been using this product for a very long time. My only problem is that La Victoria don't feel that they need to stock this product in my local supermarket, even though I was buying like two jars a week. ProsThis is a very good hot salsa with a good taste. ConsThe price is too high. I was paying $2.99 per jar and here I have to pay $4.95 per jar. Very good and hot. A favorite in this family. There are good salsas, but this is the best...I like the taste, the thick consistency and the hot, hot flavor. Nothing wimpy about this hot sauce. Turned on to it by my Mom! My Mom made us kids "Mexican Pizza's" her name for nachos for us for some 30 years ago until she passed away. She would slather refried beans, red or white onions and sharp chedder cheese on round totia chips under the broiler until the chesse melted. Then we used the Salsa Jalapeno along with sour cream on top to finish it off. I still make this dish at least three times a month usually for a fast lunch, but sometimes for dinner. The Salsa Jalepeno finishes it of just right! I have eaten this salsa for decades. It is excellent. Add this salsa to your guacamole and you will be loved!! Tasteful,hot,spicy can't find anything to compare highly recommend for anyone that has similar tastes. We are never without this Salsa. We use it in so any ways! So glad you make it available. Hope that does not change. I've been enjoying this salsa since 1968 when it was still available in stores. After enduring years of sporadic retail availability, I was delighted to find it at MexGrocer and now buy it a dozen jars at a time. Please don't stop making it!! ProsThick, a little chunky and fiery - what's not to love? This is my first experience with Salsa Jalapena. It is delicious! I have been using Salsa Ranchera for more than 40 years, then it was not available locally anymore. I knew I could find it online so I began searching. When I found Salsa Ranchera and was ready to place my order, I discovered Salsa Lalapena. I ordered it instead. What a great choice! Now I have 2 choices to choose from. Now I don't have to wait for my local supplier to get more in before I run out. Now my new supplier will be MexGrocer.com. Muchisimas Gracias!! ConsI wish I could buy it locally! I have been using La Victoria salsa for my home made tacos for over 30 years. In the mid-eighties, a coworker suggested that I cook the salsa into the meat instead of topping the tacos made with plain ground beef. Since then I have made the best tacos I have ever eaten. My friends say so too. At first I used Salsa Ranchera and Salsa Brava together. Once I found Red Salsa Jalapena at a store, I tried it and could not go back to Salsa Ranchera. I love the taste of the Red Salsa Jalapena better because of the red jalapenos being the main ingredient. Using this with the Salsa Brava makes the best tacos ever! Like other shoppers, once I could no longer find it in the store, I started buying here online a few years ago. The best salsa for tacos EVER! Cannot find it in any store here. Well worth every drop of this delightful product. ProsHot, thick, zesty. It has a freshness that cannot be duplicated. I have been using this product for several years. I cannot find it in any San Francisco store. I once found a store in Vacaville that sold it and bought all of the 21 jars on the shelf. I use the salsa on eggs and pizza but my favorite use is mixing it with sour cream for chips. ProsEverything, even the shape of the jar. This salsa is the "secret" ingredient in my wife's special cheese dip. Thank goodness I can still get it from you because it is not sold in any store around Louisville. This is my second review because i am so in love with this salsa. I f you haven't tried it you can't imagine what you're missing. this is the best tasting salsa!!!! yes it is hot but that is the way I like it. It has a great consistency and a very good flavor. There's nothing like it - anywhere! This Salsa Jalapena has a unique complex roasty flavor with a strong russet heat that is mellow and blends in beautifully with the flavors of the other ingredients. After sporadic sightings of this marvelous salsa, the supply completely dried up, which led me to inquiring on line and discovering you folks! Thank you, thank you, thank you! The recipe for this salsa is from the days when bottled Mexican foods were made with the expectation that Mexicans were the customers. This wonderful salsa got lost in the shuffle of all the 'gourmet' salsas that entered the markets in the 80s on. In fact a wonderful gourmet salsa was before their eyes, a cost a fraction of what others cost. For those that haven't tried it, it is made from chopped ripe jalapenos as the primary ingredient. Tomato is secondary. It is great in place of ketchup, and far healthier. I have been eating this salsa since the 80's. I agree, no other will do. I can't find it in any store....order it by the case from Mexgrocer...now it is not available. Hope it is still being made! I love love love it!!! ConsThe only thing I don't like...is I can't find it anywhere!!! WE GOT HOOKED ON THIS PRODUCT AND NO OTHER WILL SUFFICE. OUR STORE STOPPED CARRING IT AND SAID THEY COULD NOT GET IT. I used to buy this salsa in Princeton, NJ but they stopped carrying it years ago due to unpopular demand. Luckily, I found MexGrocer and have been since buying this salsa from them. For those who love spicy salsa, this is actually spicy...it adds a great kick to whatever you're eating. Also, my fam sometimes adds this to grilled chicken hoagies/subs - it's pretty great. In fact, we moved overseas for a couple years and took some of this salsa with us. Now that's love. No longer sold in Boulder, CO area (maybe in Denver, but it is a long drive). Been a fan of this stuff for many, many years and it is still the best. Excellent service on my order. Have been using since the 70's,was able to purchase at Safeway and several markets in Hawaii. In the late 90's, for some reason this item wasn't available in Hawaii so I had to order and shipping was expensive. To rate this Salsa, all I can say it that it's EXCELLENT, adds great favlor to Tacos, Eggs and any other food item you car to spice up. It's just great and the best found. Was just ok. Not enough favor to it. It is hot which I like, but really lacks favor. The best jar salsa out there. Most stores have quit selling it here in Merced, Ca. except for one store and I would stock up...but they don't sell it now anymore???? Whats up with that?? Then I found MexGrocer and Yeh I can order as much as I want. Hope you wont stop selling it! This is the best salsa ever! It is THE secret ingredient in my wife's cheese dip. Since it is impossible to find in stores, I buy it online 12 jars at a time. Please, please, please don't ever stop making it available. Similar to other reviews, had trouble finding this product, my favorite salsa, in grocery stores (even stores that carry LaVictoria products), so buy it several jars at a time, and glad it can be found on line. Just gotta' have it, eat mounds of it on chips till you can't stand it anymore, then eat some more! Makes all other salsa's of any kind pale in comparison. I ususally don't say that to friends, but give them a bottle to try as well!! This is the best for my Aunt Dunies Dip! Cream cheese, fresh garlic, lemon juice and Red Salsa Jalapena-Extra Hot. This is the ONLY salsa that works for this dip. This is excellent salsa. We order as much as we can eat! Another 5-star rating: See a pattern here? This is the king. Hurts SO good! Great consistency, not watery. Hot as rooster sauce with less overpowering flavor, so it's more versatile. You can overdo Tabasco Habanero, but not this stuff. Easy to find in L.A., but not here in Ohio. Grateful to MexGrocer for making it available. I was raised on good salsa. This is about the best I have ever tasted and I have tasted hundreds. Even when I lived in Sonora , Mex. I could not ever find salsa as good as this. Best salsa I've ever tasted. I've been using this since 1982 when I lived in San Diego and continue to, even though I now live on the east coast and it's harder to find. Worth paying for shipping to get. Love it. I love cooking with this salsa. It adds the perfect amount of heat and endless flavor. My family has been using this item ever since I can remember when we did not have time to make our own. I am originally from California and had no problem finding it in the store. Now I live in Oklahoma and thank God I can order it online because there is no other salsa like it.